UPDATE 04.22.10: I have replaced the link to the APFC web site containing the image of the unattributed ‘contemporaneous birth announcement,’ with a screen capture of that ‘now you see it; now you don’t’ facsimile. Last night, I received this brief comment from jan C.
jbjd: I have been told that the Honolulu Observer states that the birth information published comes from hospitals. Is that confirmed anywhere? What is your explanation for the existence of the newspaper birth announcements if he was not born in the hospital? I conducted some research to prepare my response, and stumbled across information that blunts another arrow of authenticity in BO’s quiver. I generally stay out of discussions as to whether photocopied or scanned documents posted on the web are real. (Your guess is as good as mine.) Instead, I try to find out where the image came from. I remember BO did not post that newspaper birth announcement image on his FTS web site. (I don’t mean now that the site belongs to the DNC; I mean even before the switch, back when it was still paid for by Obama for America.) I always thought this was odd. He posted the COLB, and the admission that he was a British subject at birth whose citizenship status was governed by The British Nationality Act of 1948. And I can picture the official logo of Annenberg Political FactCheck.org, which linked to APFC’s web site, where more testimonials were printed as to BO’s Constitutional legitimacy. I recall how incredulous I was at the time, that he would publicly tout Annenberg as an “independent” arbiter of his eligibility to be POTUS, since that was his boss when he was Chair of the Chicago Annenberg Challenge. (Doesn’t everyone know that?) I did remember seeing that birth announcement posted on APFC’s web site; so that’s where I went first. The image of that newspaper birth announcement is still there. I clicked on the image to trace its origin. But wherever I clicked, I kept getting back to the blog named td, or texas darlin. That is, I got to a screen with a td header and message saying ‘what you want is no longer here.’ Well, I post on td’s blog; in fact, she calls me their “resident lawyer.” (She is on my blog roll.) So the first time this happened, I figured, too many windows open, too many thumbs. Then, it happened again. And now it dawned on me, could it be that td’s site is the source of the picture of the newspaper announcement APFC posts on their site and uses to prove BO is a NBC; and APFC merely copied it? Just below the image, I found my answer: The announcement was posted by a pro-Hillary Clinton blogger who grudgingly concluded Obama “likely” was born on August 4, 1961 in Honolulu. Say what? But APFC must have conducted their own investigation, right? Surely, they contacted the Honolulu Advertiser to check the facts surrounding this birth announcement publication. Of course they viewed the archives and located that same image from microfiche or other medium. Reading just a little further, I was bound to find the record of such comprehensive investigation. But here was APFC’s last word on the subject. Of course, it’s distantly possible that Obama’s grandparents may have planted the announcement just in case their grandson needed to prove his U.S. citizenship in order to run for president someday. We suggest that those who choose to go down that path should first equip themselves with a high-quality tinfoil hat. The evidence is clear: Barack Obama was born in the U.S.A. 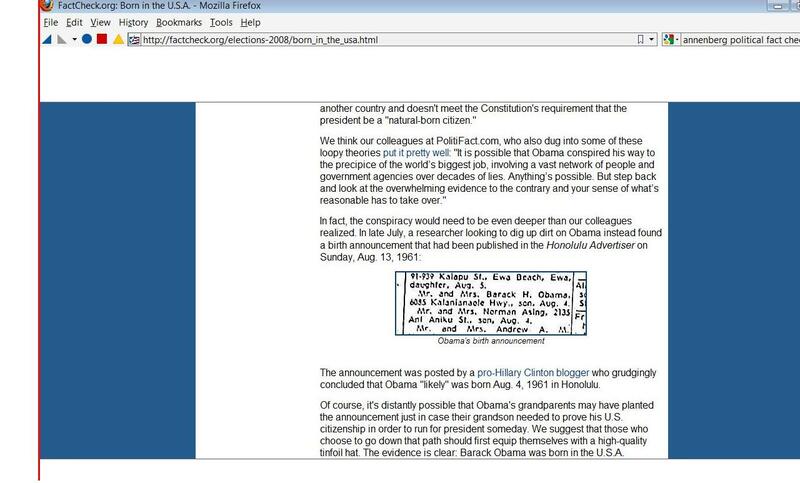 Yet, despite this overwhelming evidence the image of BO’s birth announcement in the Honolulu Advertiser posted on APFC and all over the internet, is fake; BO tried to fool a federal judge into finding this was real, too. Hollister v. Soetoro et. al is only one of the many unsuccessful lawsuits filed against BO in a frantic attempt to ascertain whether he is a NBC. As in every other case, BO submitted a Motion to Dismiss. (Defendants’ Motion in Hollister argued Plaintiff had failed to state a claim on which relief can be granted; and failed to establish the court had jurisdiction. This was all procedural; the court had not yet reached the substantive merits of the case.) I had read Plaintiff’s Complaint when it was first filed; I knew it was infirm, and the reasons why. So, I would not have read BO’s Motion to Dismiss if someone hadn’t asked my opinion. And there, in footnote 1 on the front page of the Memorandum in support of his Motion, I found this sneaky little gem of propaganda, arguably placed there to reap maximum attention from the public as much as the court. Written quite cleverly so as to disguise its real meaning, the footnote is more easily understood with translation. Thankfully, the only thing the court granted BO in Hollister was a Dismissal. In sum, the newspaper announcement of BO’s birth is a sham, making the rest of your questions moot. UPDATE 08.14.09: Based on his submission of this footnote to the federal court in January, I am surmising that the strongest evidence BO could have provided to NP to verify his Constitutional status before she Certified his eligibility for POTUS on August 27; was this same APFC characterization of authenticity. BUT THE STRONGEST EVIDENCE HE HAD TO PROVE TO THE COURT HE WAS A NBC; WAS THAT CERTIFICATION OF NOMINATION NP SIGNED AND FORWARDED TO STATE ELECTIONS OFFICIALS SO THAT HIS NAME COULD BE PRINTED ON THE STATE GENERAL ELECTION BALLOTS! This begs the question: why did lawyers from PERKINS COIE ask the court to take judicial notice their client was for real by referencing a web site run by the organization APFC, given that they could have cited his authentication as a natural born citizen in any one of the 50 Official DNC Certifications of Nomination sworn to by the Speaker of the U.S. House of Representatives? This entry was posted on Sunday, August 9th, 2009 at 16:02 and is filed under Annenberg Political Fact Check, Barack Obama, birth announcement, Birth Certificate, Certification, FactCheck, Fraud, Honolulu Advertiser, NBC, PERKINS COIE. You can follow any responses to this entry through the RSS 2.0 feed. You can leave a response, or trackback from your own site. Brother, if losing my comment was the worst of it, you’re doing alright. I am relieved to see you got your outstanding post back. Great analysis, superior coherence, and rational to a fault (as always). Cheers and obviously you haven’t chapped the Lord’s (*) to any significant degree lately as evidenced by your retrieval. Ha! jbjd, Great post! Another piece of the fraud, exposed. I am curious to see how deep this fraud goes. Forging documents, and usurping the Presidency of the United States of America, calls for some harsh justice. I believe, what we have is, GE Corporation, in collusion, with “Obama”, to usurp, the Presidency. NBC,and MSNBC have gone beyond reporting, on the Natural born citizen issue, to the point of defending, and covering up, the fraud. This is some very serious crime! What is it going to take before people realize the depth, and magnitude, of this fraud? All Obama gave us, to prove, where he was born, is a forged COLB, and a photoshopped image, of a supposed, newspaper article, along with, NBC, and MSNBC’s,(GE’s), complicity,and we have,fraud, in the first degree. I hope, someday, all of your hard work, will be rewarded, when justice is done. bob strauss: Thank you very much for appreciating the hard work that goes into this endeavor. I began offering ‘advice’ on other people’s blogs because some of the posters had no idea how the ‘system’ worked. I, too, was pretty ignorant (read, complacent) before this past election cycle. (Even if I had been more involved in the political system, this would not have helped me to anticipate the problems that confronted us, because many of these presented issues of first impression.) I figured, if it took me this long to figure things out then, others must be in the dark, too. So, I began posting comments on the blogs. But I had to keep repeating the same answers, over and over again. That’s why I set up this blog. It is rather rudimentary by blog standards but, if you scroll through, you can really learn a lot. And I worked really hard to learn the things I post here, so that I can write about them! As to your statement that you hope my hard work will be rewarded, well, the fact that my efforts attract people like you, who learn, question, and comment is quite rewarding. You know jbjd, I remember that post and thought immediately to myself, “how friggin convenient”, and had hoped someone over at TD was looking into its authentication. I was new to blogging at that time and did not trust my skills nor myself enough to do any exploring on my own. This is extremely important, however, is there anyway possible for TD to do any tracing on that poster? Is there anything TD could add to this critical conversation about that poster? Could that poster have been assigned to track TDs site by the 0 team? If so, could the 0 team have been cyberstaking out TD’s website due to Judah’s provocative posts on Constitutional/Article II law AND 0’s Kenyan and Indonesian background? It would make perfect sense that they’d use her site to plant that announcement. Oh my, jbjd, oh my. jbjd: That was a most crucial insight: That FactCheck DOESN’T check facts. That all they do is take things from Internet blogs and put it out there as TRUTH. For all I know, nobody has independently found and verified the original microfilm containing those ads, although after the Honolulu Advertiser ad came to light, another ad from (allegedly) another newspaper was mentioned in a newspaper article. Where that ad came from, I don’t know. It depends upon whether or not one trusts the writer. Did he or she simply receive it from Obama’s people, a la the COLB? It wouldn’t surprise me. In fact, a story at WND today says that the AP is going to take stories directly FROM Soros-funded “not for profits” and run them through all their outlets. At TD’s blog, back when this first came out, we pointed out the problems with the listed address: That the Obamas didn’t live there; that Obama Sr. lived in an apartment; that he allegedly also had a room in student housing on campus, where she couldn’t live with him; that people named Lefforge lived at the address in the ad; that the remaining long-time owner had JUST died, making it impossible to question HER whether or not the Obamas ever lived there; that Mr. Lefforge was a professor at the U of H AND friends with muckety mucks in the local Democratic party. I also asked TD very recently about the announcement. My question, last time I checked, hasn’t been answered, either. I seem to remember that TD was angry that people took her work without crediting it, so that particular post was taken offline. I remember that the anonymous poster was named Lori. I don’t know who she is. I do know her surname, but if she’s trying to stay anonymous, I’m not going to “out” her. I don’t know who she is or what her goal was. It may have been to learn the TRUTH, something which is sadly lacking in the Obamanation. Lori said that she called the Hawaiian source (I can’t remember if it was the newspaper or a library), asked for a copy of that page of vital records from the paper, and that’s what she received in the mail. Apparently, she forwarded a scan of the page to TD. TD had the intellectual honesty to post it on her blog, despite that she’s a political opponent of Obama and a strong supporter of Hillary Clinton. Another anonymous poster at TD’s blog recently stated that he or she had a friend go to the library in Hawaii and access the microfilm. If you believe this person’s account, the microfilm has exactly what’s posted online. However, can we believe ANYTHING anymore, without seeing it with our own eyes? It’s interesting that Obama’s lawyers neither proferred to the judge a certified copy OF the COLB OR a copy of that birth announcement. Isn’t it? IF those items are legitimate and since they are already in the public domain, then there’s no privacy issue involved and it would certainly be much more convincing to a judge to see the other side be forthcoming with PROOF to rebut the plaintiff’s allegations. Right? Thanks for the information. It takes a legal mind to keep up with the tricky ways of this im-POTUS. You said that there IS no birth announcement because of how Obama’s lawyers worded the footnote. Interesting. I wonder how the newspaper reporter received the other announcement, supposedly from another newspaper? As for your number 3, is this post (this one, to which I’m commenting) the one that OFI swiped? Amazing. I’ve never seen their site, but there certainly are a lot of plagiarists (or thieves) out there in the blogosphere. 1. He doesn’t have anything more than the COLB to show the nation. 2. He does have it but he needed to keep attention on his lack of showing it as a smokescreen for the eligibility issue due to his British birth. “Is it fair to say that it took more than just a long form Birth Certificate (singular) for the DoH or the AG of Hawaii to verify NB Citizenship based on the following statement? It sounds like it took something supplemental as well, like an amended return with something considered ‘evidence’ of birth place or parental lineage, therefore Dr. Fukino says she has seen the “vital recordS” (plural). Letters from a hospital submitted LATE as proof of birth, for example, are considered ‘vital records.’ I know because I asked that myself. If already he had a long form BC that verfied NBC, that would be enough to verify it and no other records would have any relevance. “What types of original “vital records” (plural) did Dr. Fukino see, that verify The President is a “natural-born American citizen.” according to her public statement below? I only want to know the type of records she looked at that the DoH maintains on file, not any information within the records. I also, want to know if an individual’s original long-form birth certificate maintained on file by the Hawaii DoH is enough to verify citizenship and birthplace if the DoH does not file and maintain any other vital records outside of an Original Birth Certificate for an individual? Wouldn’t this be easy to figure out? Doesn’t the newspaper have public archives? Yes, but I mean wouldn’t it be easy for you, any or your friends (in Hawaii? ), or industrious readers to go take a look? Then neither you or them would be speculating. I would seem to be VERY helpful to the cause to have PROOF that the newspaper thing is bogus. If nothing else it ought to make front page news on any number of Blogs and on WND and even Globe Magazine! Carlyle: I absolutely understand the feelings you express here, in which expression of such feelings you are joined by people throughout the blogosphere. Let’s focus on this line: “Then neither you or (sic) them (sic) would be speculating.” So, the question is, would not finding such reference establish, there was no such announcement? And the answer is no. Not finding such reference could mean, the reference is missing; or the archives were damaged; or the researcher is incompetent. I approach all of these document-posted-on-the-internet-authenticity issues by asking this question in advance: if the document is real, does it prove what the claimant (the person basing some claim on this document) says it does? If the answer is no, I don’t get involved in discussing whether the document is real. For example, if that newspaper announcement had been real, would it have proven BO was born in HI on August 4, 1961? And the answer is, no. Even if the newspaper postings were based on information automatically sent by the HI DoH upon registrations of birth, this does not prove the newspaper printed this announcement based on information received from the DoH. And, even if the newspaper received information from the DoH, this does not mean, the registration was in the form of a Certificate of Live Birth issued by a hospital or, a Certification issued by the DoH based on vital documents provided by the petitioner. I remember that you made a similar post about the gravitas of Obama’s Colb rebuttal some month’s back. If the strongest evidence that he has is an inteernet screen shot from an Unsworn witness, then he has nothing at all. Of course, with the cases being dismissed, he doesn’t really have to respond with ANY evidence. I still like your Declaratory Judgement case with a Federalized National Guard call up as plaintiff. Of course Orly screwed up her chance with that line of attack. Great post, jbjd. It looks like with the obama case, we need to read between the lines that are between the lies that are between the lines. The One is very smart, but when you lie you’re all over the place. I’ve been thinking of this for some time now… I feel that the breaking point of this mess is closer than we think. And by having the “smartest minds around” do and say everything for him, he maintains degrees of separation and, when necessary, toss those smartees under the proverbial bus. Thanks again, jbjd. You continue to nail it, by exposing the tricky words of these lawyers. I would hope that one of the judges would be as astute as you and read between the lines and realize that defendant’s lawyers are trying to put one over on the court. Very interesting article, jbjd. I remember when td posted the ad and Miri’s comment covers that well. I also remember reading that blurb on the APFC and assumed they were referring to td. How bizarre that the only evidence of his eligibility in the Hollister case are the same old ridiculous colb and that little ad. I think the conclusions you come to in the last paragraph must be right. Socalannie: Welcome. Re-read that annotated footnote. BO did not actually reference that COLB to tell the federal court, APFC verified that he was born in HI. Rather, he says, they verified he had a real (document with the title of) COLB that says he was born in HI (from which he made a copy that he posted on his web site, FTS). He never said APFC verified with the HI DoH that their files contain an original COLB that looks just like that; or that they even contacted the DoH to verify the document was a real certified copy of their records. See the difference? And he never told the court the Honolulu Advertiser provided a copy of a birth announcement contemporaneous with his birth; he said, APFC noted a newspaper announcement on their web site. And they did, in the context of explaining, they had obtained the image we were looking at and this was “clear evidence” BO was born in the USA. Ahh. Yes, I do see & thanks for pointing out the difference. Very very slick. This whole birth cert/nbc story never ceases to amaze me. Thanks for all the time & research you’ve put into this. So, it depends upon what the meaning of “certified” is. Certified by FactCheck.org? A copy of A birth certificate. Not a copy of HIS birth certificate. Just a copy of “a” birth certificate. Not a copy of his original birth certificate. Possibly a copy of ONE of his birth certificates. Or possibly a copy of a completely bogus birth certificate, but one with a “certification” on it. A copy of “a” birth certificate SHOWING that he was born in Hawaii. Not PROVING that he was born in Hawaii. Just a copy of “a” birth certificate SHOWING that he was born in Hawaii. So, the copy of a birth certificate is making the claim that he was born in Hawaii. Obama’s not making the claim. He merely publicly produced A copy of A birth certificate showing that he was born in Hawaii. No comma between “certificate” and “showing”. So the phrase “showing that he was born in Hawaii” is part of the entire object of the verb “produced”. If it said, “produced a copy of a birth certificate, showing that he was born” in Hawaii, then the sentence would imply that the copy of the birth certificate is solid evidence that he was born in Hawaii. At least his lawyers admit that Obama publicly produced this copy. But think about it: Somebody else publicly produced a certified copy of a birth certificate showing that Obama was born in Kenya. If plaintiffs’ attorneys had put that information into a footnote, would that make it true? Would that mean that the court finds that it’s true? Yes. We’re not in Kansas, anymore. And English doesn’t mean what it used to mean, either. See if this link works. Let me know if it doesn’t. I was in the process of answering a question jbjd asked me yesterday, when I stumbled across this, which includes a recent update by TD. Just wanted to express my appreciation for your excellent blog. You provide great legal reasoning (sans any hysteria that pollutes some of the other attorney sites out there)that helps those of us who are not attorneys to get a glimpse of how legal reasoning is used. I will be coming here often and will refer others here,too for a more sane and credible attorney site on the Obama Drama! He admits he is not an attorney and neither am I, but this does not sound right. From my contracting background, I thought there were some common law concepts applied to commerce, but it has been too long to remember correctly. I believe I read in one of the web blogs something about this common law issue as pertaining to NBC status, but do not remember what it is. Could you enlighten us on this? Thanks! But notice that the person tipping Pam to the announcement claims that the research librarian had the info on hand, because someone else lately requested it. That someone else would be Lori who first reported the announcement at TD’s blog. What codswallop. All any United States court has to do is take judicial notice of President Obama’s Hawai’ian certification of live birth and it’s all over. There is no need to provide any other information. One parent, no parent a citizen. It doesn’t matter. (US v. Wong Kim Ark.) Born here. 14th amendment. Game over. On the other hand, the issue is also non-justiciable, so no court will ever reach the merits. But if it did it would be game, match and set with the COLB. STepper: I cut out your comment for 2 (two) reasons. First, in ‘so many words,’ you again called the attorneys who disagree with you, names. Second, you engage what looks like a ‘legal’ argument as to the distinction between ‘citizen’ and ‘natural born citizen.’ Such discussion is outside of the scope of the analysis presented in this post. However, there are several on-line sites where you can engage in such discussions. jbjd. Brilliant sleuthing and excellent explanation! Comments here by all are so interesting as well and informative. wow. we are closing in! jbjd: You must be getting close if you’re attracting loyal opposition like STepper. Congrats! jbjd, the clarity of your writing is top shelf. We have the truth; Mr. Obama has (limited) power. Coalition forces led by the U.S. vs. Saddam Hussein and the Baathists of Iraq. Desmond Tutu in South Africa. My great hope is for either Divine intervention or for Christians to be snatched away by the Lord Jesus Christ. But until that happens, Mr. Obama probably sees the U.S. armed forces rallying to support and defend the Constitution of the United States as the greatest threat to his usurpation. The military will not be intimidated or stopped by the Chicago Machine, the Mob, the Nation of Is|am, union outlaws and thugs, or law enforcement units loyal to the totalitarian regime. I would rather petition the Joint Chiefs of Staff than any other human institution. The birth announcement image on APFC article ‘Born in the U.S.A.’ no longer links to TD’s blog. The link is to the front page of the Honolulu Adviser and no birth announcement image can be found on that web page. This change with no explanation makes APFC look very unprofessional. I did find this article after a search and if you click on that birth announcement image, as you can see, it’s a different image. This change with no explanation also makes APFC look very unprofessional.